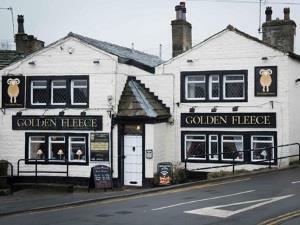 Golden Fleece Oakworth01535 645930work Public HouseA traditional Yorkshire pub set in the rural village of Oakworth. Local Cask Ales, Pool, Darts, Dominoes, Board Games, Free Wi-Fi. Disabled access and large car park. There is an extensive patio which is a real suntrap. Children, Dogs & Walkers are always welcome. Delicious home cooked meals & legendary Sunday Lunches, plus we have a fabulous Gin Bar. A traditional Yorkshire pub set in the rural village of Oakworth. Local Cask Ales, Pool, Darts, Dominoes, Board Games, Free Wi-Fi. Disabled access and large car park. There is an extensive patio which is a real suntrap.